Uefa referee officer Hugh Dallas says Scottish officials remain among the best in Europe. With three British sides having qualified for the Euro 2016 finals, it makes it less likely that Scottish and English referees will be chosen. "We will wait to the draw, but our referees are definitely in the mix," said former referee Dallas. "We've got some really good referees in Scotland. They can stand up with the best referees in Europe." Scotland's Willie Collum and Craig Thomson, plus England's Martin Atkinson and Mark Clattenburg, are among the European governing body's group of 29 elite referees. While Scotland have failed to qualify for next summer's finals, England, Northern Ireland and Wales will be in France, while Republic of Ireland are involved in a play-off against Bosnia and Herzegovina. Looking ahead to the draw in December, Dallas told BBC Scotland's Sportsound programme: "Uefa look upon the Republic of Ireland as far as British interests go, so it will depend on where those four teams appear. "If they are all separated into four groups, it makes it much more difficult to appoint UK officials." Collum has had three red cards rescinded by the Scottish FA within the last nine months and several Scottish Premiership managers have also been critical of refereeing decisions in general this season. But Dallas defends the standard of the country's officials. 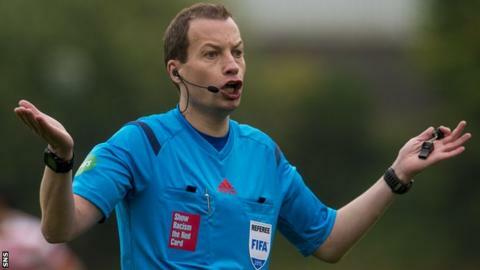 He believes having two referees in the top 10% of officials from 54 countries, plus Bobby Madden and Steven McLean among Europe's "first category", is a healthy figure. "They are refereeing well and we continue to follow them and mark their progress, but they are certainly not doing any worse than any country at the moment at the very top," said Dallas. Dallas does not think that referees come under any greater scrutiny now than in previous years but believes the spotlight will increase next season should Rangers win promotion to the top flight. "When I refereed, every game mattered," he said. "It was so competitive that it didn't matter if it was St Mirren at home to Rangers or Celtic were at home to Hibernian. "I think next year, if we maybe see the league being more competitive, there will be more pressure then on referees. "But I think the referees are ready to step up to the mark for it." Dallas could understand why managers would be critical of refereeing decisions in after-match interviews but urged them not to make their remarks personal. "Referees will say it doesn't get to them, but they're human - it has got to affect them," he said. "Nobody likes picking up the back page of the newspaper and seeing a manager personally having a go or a pundit having a go. "That's too personal and that's got to affect a referee. "Match officials have got families, they've got kids in school, they've got wives in the office and it impacts right through the family and it can be tough times for them."